Recently I got to witness a modeling miracle. Like most of our past training courses, the instructor (in this case FlexSim’s training manager Regan Blackett) sat down with one of the attendees to build a model he wanted to start working on. It was a manufacturing system with a few unique elements, including components shared between different facilities. The training attendee assumed it would take a few days to have a working version of the model — 90 minutes later, and thanks mostly to a brand new tool, a sizeable portion was already finished. Back in October at the FlexSimposium, we unveiled an innovative and revolutionary way to define logic in a 3D simulation model. This tool, called Process Flow, has since become a rock star around FlexSim headquarters. It’s made an appearance in nearly every consulting project we’ve done since its earliest beta release. It’s easily punched out picking operations, crushed call centers, and put a licking on logistical systems. 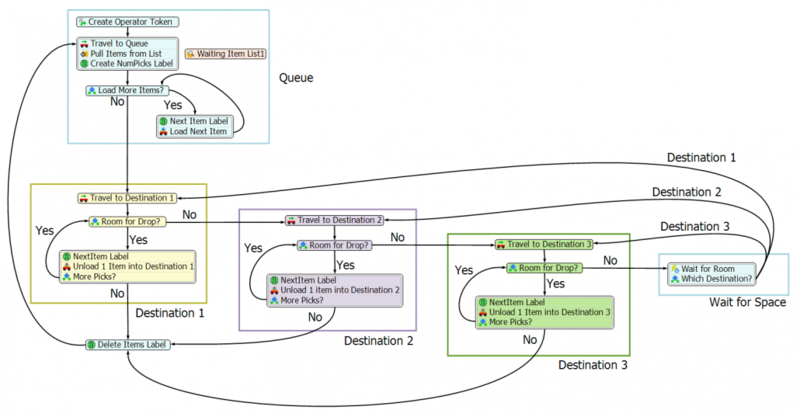 Dustin Derrick, a consultant at FlexSim, tells a story about a massive, beautiful system logistics model that took him nearly a week to debug. The model’s logic was spread across dozens of queues and processors. It was an enormous task just to track down why an operator was appearing somewhere he wasn’t supposed to be. What about that enormous system logistics model? Dustin estimates the same debugging task would have taken him less than an hour if it were built using Process Flow. The only way to know how much time you will save is to give it a try. Sign up now to download FlexSim’s free evaluation version or download FlexSim here.